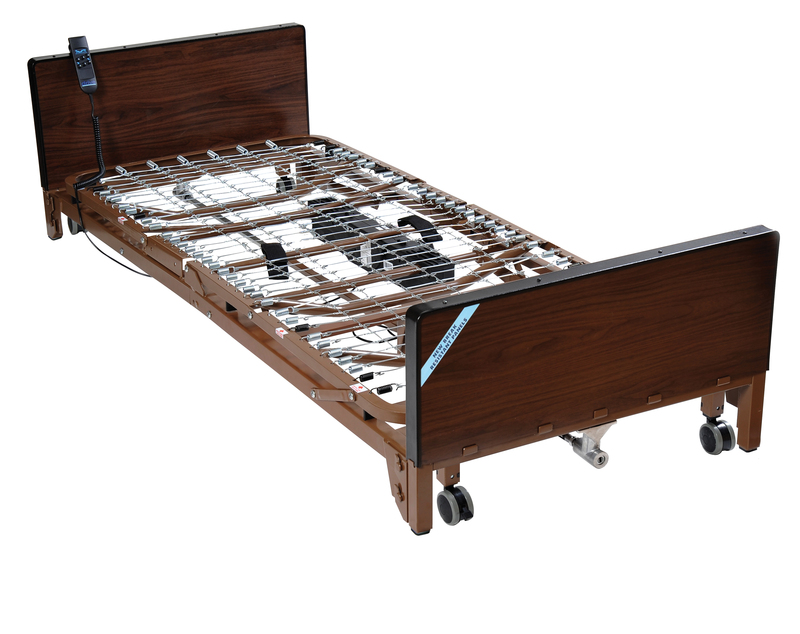 A pre-installed motor on this ultra light electric bed from Drive Medical allows you to adjust from standard to low height suiting your ever-changing needs. A motor near the foot section of the bed lets either the patient or caregiver choose the proper height for them. And the motor can be assembled or disassembled tool free even while the patient is in the bed. The bed is strong enough to withstand a weight capacity of up to 450 pounds yet features a caster that moves easily making adjustments between 9.5"-20" deck height a cinch. In the event of a power failure a 9-volt battery located in the motor can lower the head and foot sections up to nine times. A new-and-improved hand pendant includes large and easy-to-use controls. In addition to these various features you can expect a durable and impact-resistant product that is easy to set up out of the box. The bed and features channel frame construction with zinc coated spring deck to provide superior strength and reduced weight. The end panels are washable making upkeep of this bed quick and easy.